Biographical films have been a popular film genre since the 1920s. There are films about actors that you may have never heard of, scientists who did great things and musicians who died young. Life stories were changed to make a most interesting film, but also to protect individuals who were still living when the film was made. Along with the fabricated biographical information, I have also wondered how similar actor and the person they are portraying look alike. I am starting a series of posts that will compare the appearances of the actor and the role they are playing. I thought it would be fun and interesting. I’ll be dividing these up by categories (i.e. presidents, actors, writers), making athletes my first one. The Babe Ruth Story (1948): I haven’t seen this movie, but I have heard it’s not very good. William Benedix plays Babe Ruth. Benedix is great as a comedian or a bad guy, but I have a hard time picturing him in a biography. Appearance: They both have that “big oaf” look, but don’t look very much alike. “Pride of the Yankees” (1942): This is one of my all time favorite movies. I love Teresa Wright, who plays Gehrig’s wife, and Gary Cooper does a wonderful job in the film. Very touching and sweet. Appearance: Cooper looks fairly similar to Gehrig. This is probably one of the best “look-a-likes” as far as biopics go. “The Stratton Story” (1949): This film stars June Allyson and James Stewart as a husband and wife. Stewart is baseball player Monty Stratton who loses his leg during a hunting accident. The film follows his struggle to attempt to play baseball again with his prosthetic leg. Appearance: Other than the fact that both men are skinny, I don’t think they look very much alike. “Fear Strikes Out” (1957): Perkins plays Jim Piersall (still living) who has a nervous breakdown while trying to please his father (Karl Malden). I don’t think these two look alike at all. 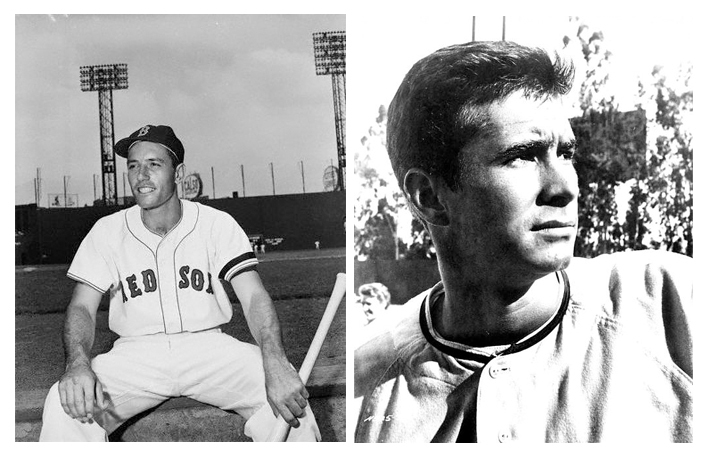 Appearance: Piersall is the attractive, fresh all-American guy while Perkins is much more dark and brooding. 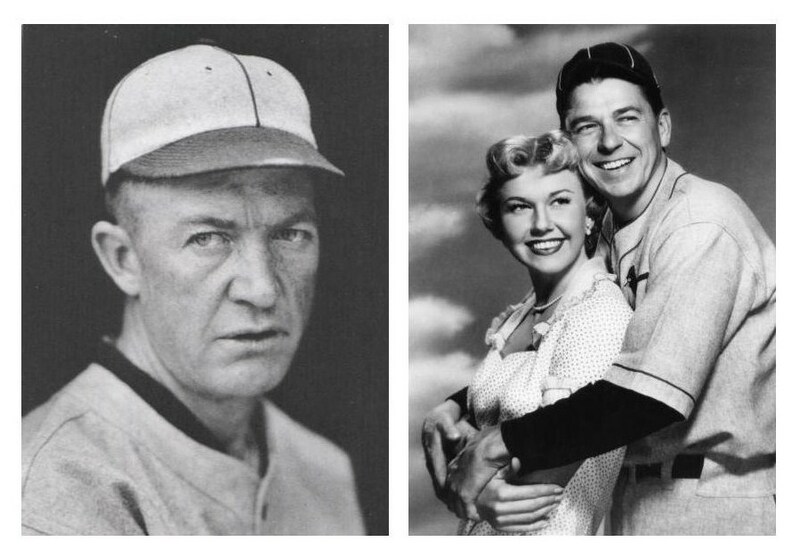 “The Winning Team” (1952): The film starts off happy as Aimee (Doris Day) and Grover Cleveland Alexander (Ronald Reagan) get married. 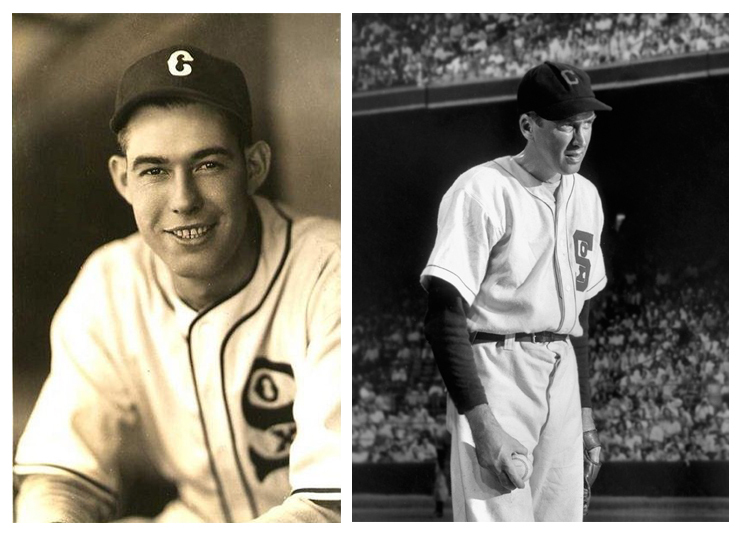 Just as Grover is rising to the top as a pitcher, he suffers an eye injury which impairs his vision. Grover is bitter and turns to alcohol which makes him unreliable. Appearance: I don’t think Alexander and Reagan look anything alike. Alexander has harsh, rough features and you can tell he went through a tough time. Reagan has clean looks. I think Grover Cleveland looks more like Harry Carey, Sr.
**I know I left out “The Jackie Robinson Story” (1950), but he played himself so no look-a-like comparison. “Knute Rockne: All American” (1940): My family isn’t fans of Notre Dame football. 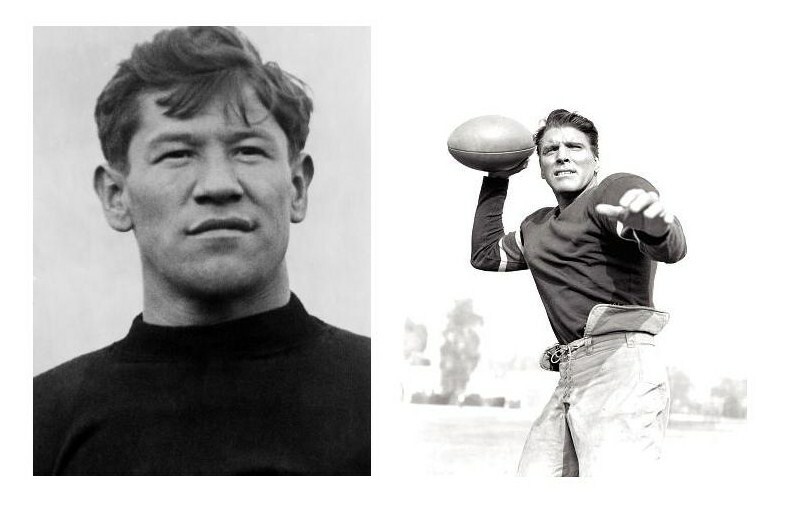 But Knute Rockne is the only reason I might be, because I really like this movie. The film covers the life of the football player and coach. Rockne is known as “America’s most renowned football coach” and also popularized the forward pass. However, it drives me crazy when they pronounce his name as ‘K-nute’ in the movie instead of ‘Newt.’ Appearance: Along with Gehrig and Cooper, Rockne and O’Brien look very similar as well. Rockne has a rougher look, but they have similar facial features. It appears O’Brien was given a false nose for the role. 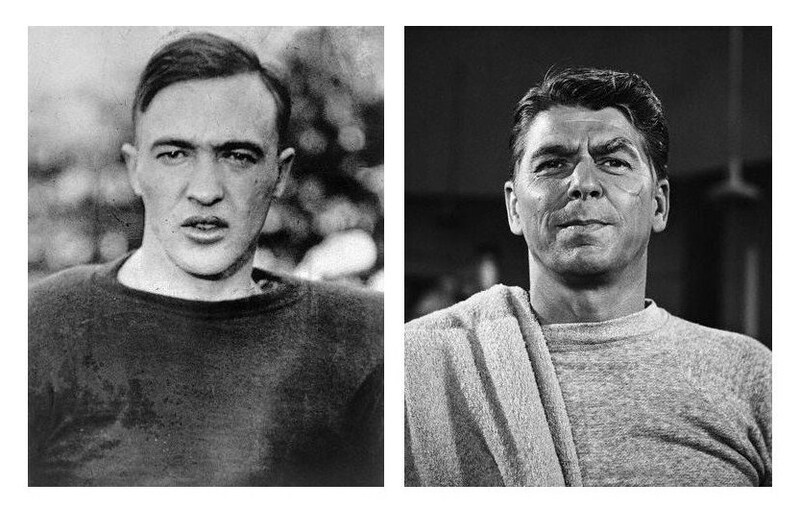 “Knute Rockne: All American” (1940): Also from “Knute Rockne,” Ronald Reagan plays George “Gipper” Gipp. Gipp is known today as one of the most versatile athletes playing halfback, quarterback and punter. Gipp died at age 25 in 1920 of either pneumonia or strep throat (the cause is debated). His death spawned the famous quote by Knute Rockne, “Win just one for the Gipper.” Appearance: Ronald Reagan does a great job in the film, but looks nothing like the Gipper. Gipp was much bigger and had very broad features. I can’t think of a 1940s actor that he looked like. “Jim Thorpe-All American” (1951): Burt Lancaster plays Jim Thorpe, early 1900s football player of American Indian ancestry. Thorpe was All-American in 1911 and 1912 at Carlisle University. He was in the 1912 Olympics for decathlon and pentathlon and was awarded two gold medals that were taken away. Appearance: Thorpe and Lancaster don’t really look alike, but they have similar facial shapes. Thorpe is bigger while Lancaster is thinner and most likely shorter. “Gentleman Jim” (1942): This is an overlooked film of Errol Flynn’s which I think is quite good. Flynn plays James Corbett who is a crude, bare knuckled boxer in San Francisco. In the late 1800s, boxing isn’t considered a “gentlemanly” sport so the gentlemen of the area sponsor Corbett at an exclusive sports club to change the sport’s image. 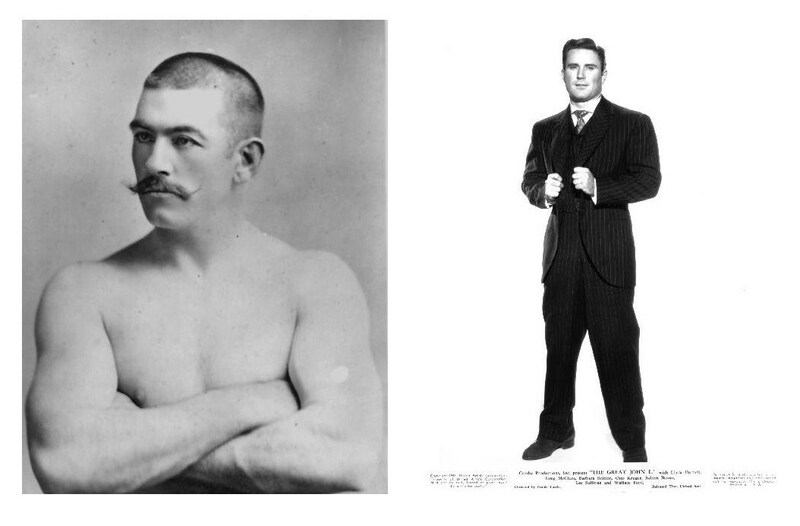 Corbett is best known for defeating John L. Sullivan (played by Ward Bond). In between the fancy footwork, Corbett finds time to romance Alexis Smith (who plays Victoria Ware) and make wise cracks with Jack Carson (playing Walter Lowrie). Appearance: Corbett and Flynn look nothing alike. Flynn is thinner and has a more debonair look. Corbett is handsome, but in a rugged sort of way. “The Great John L.” (1945): I’ve never seen this movie, but I couldn’t talk about boxing films and not mention John L. Sullivan. Sullivan is one of the most famous boxers and was the first heavyweight champion of gloved boxing in 1881 and 1882. The film about his life stars Greg McClure in the title role, Linda Darnell and Otto Kruger. Appearance: These two men couldn’t look any different. Sullivan looks gruff, mean and like someone I wouldn’t want to meet in a dark alley. 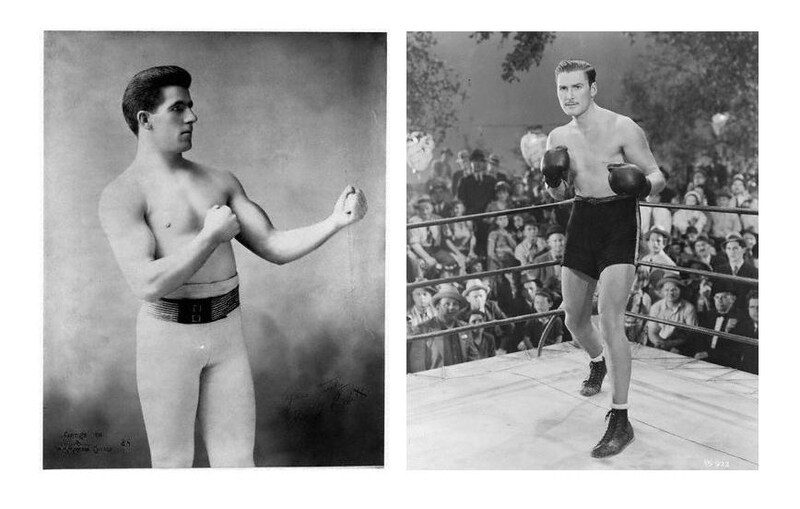 I think McClure looks more like boxer Jack Dempsey, heavy weight champion of the world in 1919 and 1926. “Somebody Up There Likes Me” (1956): I’m not much for dark, angsty, brooding 1950s films, but I was pleasantly surprised by this film. Instead of being a downer, it ended up being rather uplifting. Newman plays Graziano who can’t seem to stay out of trouble. Constantly arrested and goes AWOL from the Army. He meets his wife Norma, played by Pier Angeli, and starts his career boxing which helps straighten out his life. Appearance: Graziano and Newman don’t look much alike. Graziano has a much thinner face while Newman’s is more chiseled. That’s all for sports! Stay tuned for more biopic comparisons! This entry was posted in Reviews and tagged biopics, Fear Strikes Out, Gentleman Jim, Gipper, Jim Thorpe All American, John L Sullivan, Knute Rockne, Ronald Reagan, Somebody Up There Likes Me, sports biopics, Stratton Story, The Babe Ruth Story, The Great John L., The Pride of the Yankees, Winning Team by Jnpickens. Bookmark the permalink. This is such a great idea for a post! 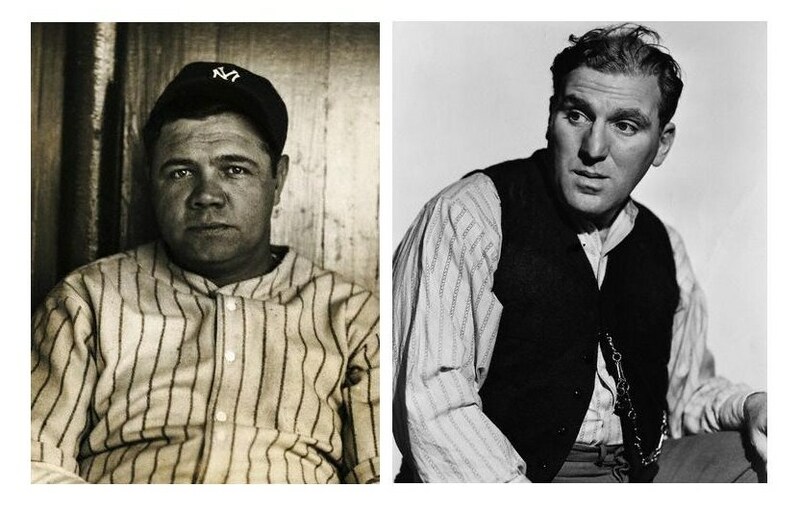 The Cooper/Gehrig similarities are crazy. They even have the same dimples. Their resemblance really is unkanny! I thought it was perfect that I lucked out and found them in similar poses. What a great idea for a series! I can’t wait for the other installments. I love *The Pride of the Yankees*. Such an inspiring and touching film! 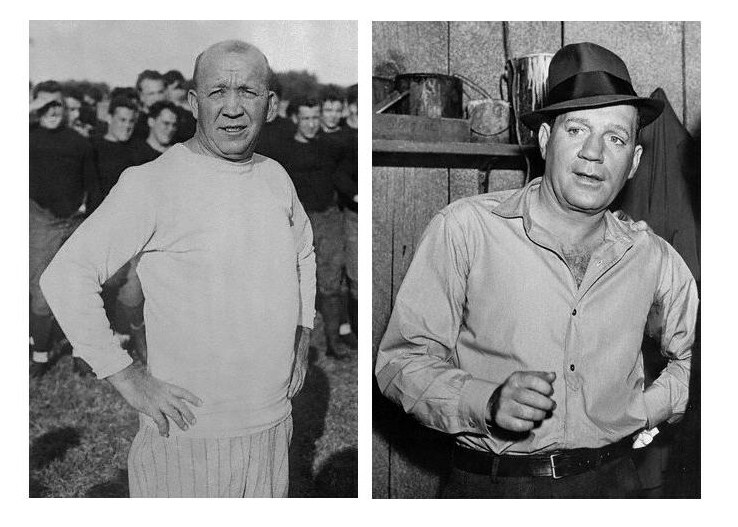 My family is into Notre Dame football, so I grew up watching the Knute Rockne biopic. I never noticed that Pat O’Brien had a false nose in it, though. Good call! I’m not really sure why my family doesn’t like ND football. I don’t really care one way or another. I think it may be because they always play and beat our team, Clemson lol. Very enlightening and interesting post. I look forward to the next installment. Poor Pat O’Brien. If only he had lived in the era where they gave Oscars for false noses! I think he did a great job in the movie. He’s so in tune with the character it’s easy to overlook that he is acting. Thanks! I’m excited about the future posts. 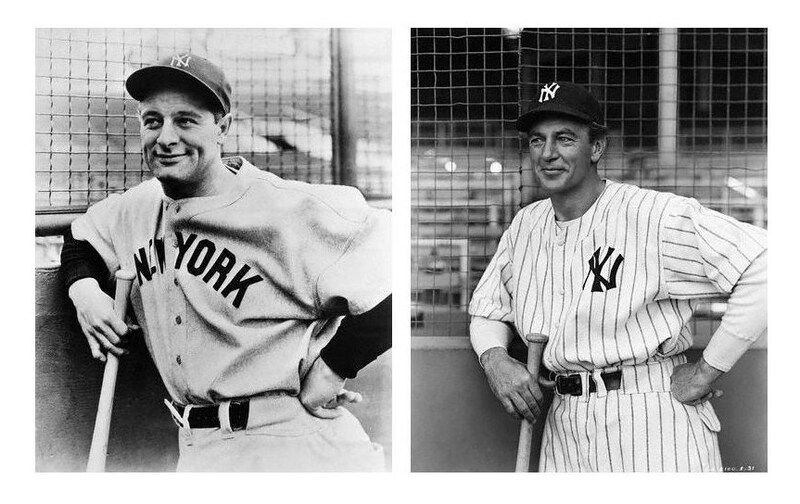 What a wonderful post.. Lou Gehrig and Gary Cooper, do look a lot a like. I know! Isn’t it an amazing resemblance? That might be the best of all the bio pics I’ve seen. Very interesting article, but I think you overlooked the resemblance between Ward Bond and John L Sullivan in “Gentleman Jim”. 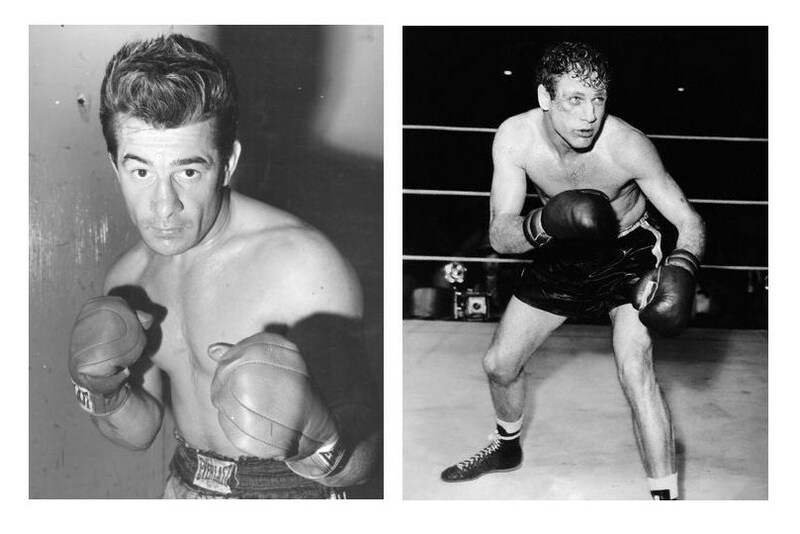 I’ve been a big student of boxing (I even named my son John Lawrence, after the great John L) since I began practicing it at the age of 10 in 1976 (you guessed it, seing “Rocky” at the drive in started me on the path lol). And, I’m 48 and still at it. I even lost a decision to future heavyweight champ, Michael Moorer, as an amateur. Nowadays, I practice BKB (bare knuckle boxing) because it’s actually slower paced and you don’t wear those dangerous gloves. There may be more cutting, but less brain damage lol.